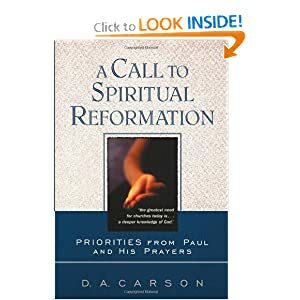 D. A. Carson | Pray for Revival! You are currently browsing the category archive for the ‘D. A. Carson’ category. Much praying is not done because we do not plan to pray. We do not drift into spiritual life; we do not drift into disciplined prayer. We will not grow in prayer unless we plan to pray. That means we must self-consciously set aside time to do nothing but pray. What we actually do reflects our highest priorities. That means we can proclaim our commitment to prayer until the cows come home, but unless we actually pray, our actions disown our words. (D. A. Carson, A Call to Spiritual Reformation, 19).